I grew up playing Tetris. I got a Game Boy the Christmas after it was launched and played Tetris more than any other game on that system. The Tengen version of Tetris is one of my favorite NES games, and it is a crime against humanity that Nintendo forced it off of the market. Because of my longstanding love for the game, I am always interested in checking out any new Tetris ports that I come across. Usually I’m left disappointed, and Tetris-S doesn’t do anything to break that trend. This should be a great version of the classic puzzle game, but it looks a lot better than it plays. Especially when things start to speed up, you need controls that are crisp and respond quickly, but Tetris S makes me feel like I’m playing Tetris on my cell phone. The game feels unresponsive when I’m trying to manipulate the pieces, and at the same time moves too fast when I am trying to move them from one side of the screen to the other. 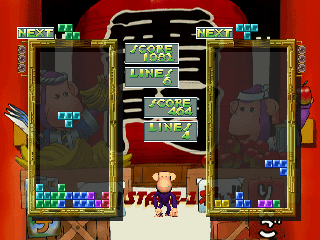 Three game modes are included; classic mode, which is just single player Tetris, and versus modes against either the computer or a second player. The versus modes have a neat twist in that instead of just dumping garbage onto your opponent’s pile, you cause their pieces to temporarily drop at a lightning-fast pace. I assume this is designed to give you a fighting chance against the sudden onslaught of puzzle pieces, but since the game’s controls are so terrible, it might as well just dump garbage instead. Tetris S isn’t totally unplayable, but when there are as many Tetris titles out there as there are, inferior ports like this don’t need to be tolerated. Over 20 years after it was released, I’m still looking for something to take the place of Tengen Tetris. Buy Tetris S on GameGavel or Amazon. Tagged 1996, Puzzle, Review, Saturn, sega, Tetris, Tetris S. Bookmark the permalink.